This is summarized primarily from Manual of Fruit Insects, by M. V. Slingerland and C. R. Crosby (1915). I. Introduction: This moth is widespread in eastern North America. It is rarely of economic importance, but may be common in isolated locations. 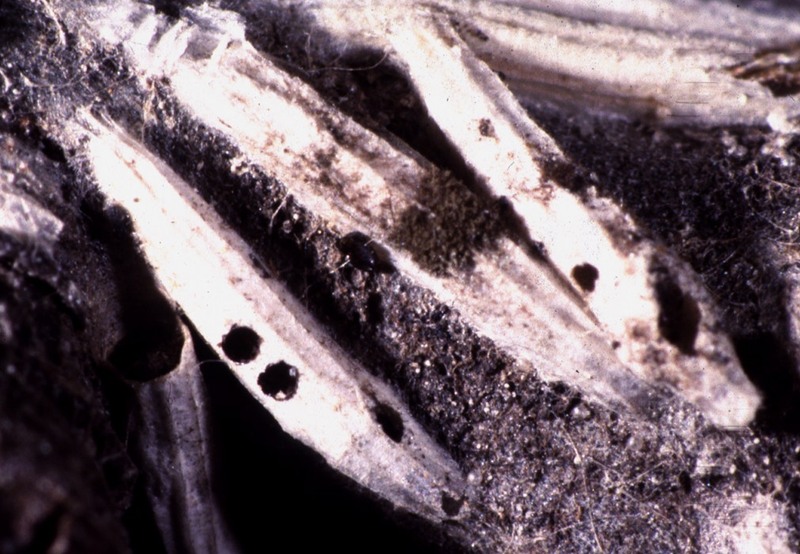 Under outbreak conditions, leaf injury (skeletonizing) can be severe. Little attention has been paid to its biology and control in recent years. III. Description: The larvae are greenish brown caterpillars. Adults are light brown moths measuring only about 1/16 inch in length; there is a dark brown spot on each wing. Cocoons are characteristic - white with longitudinal ridges running the full length, and about 1/4 inch in length. IV. Biology: The biology of the ribbed cocoon maker is not well known. Pupae pass the winter in cocoons on the bark on the undersides of smaller branches. Adult emergence occurs as leaves are unfolding in the spring. After a few days, tiny light green eggs are laid on the undersides of leaves. Eggs hatch in 6-10 days, and larvae tunnel directly into the leaves. Each larva creates a narrow mine for about a week. 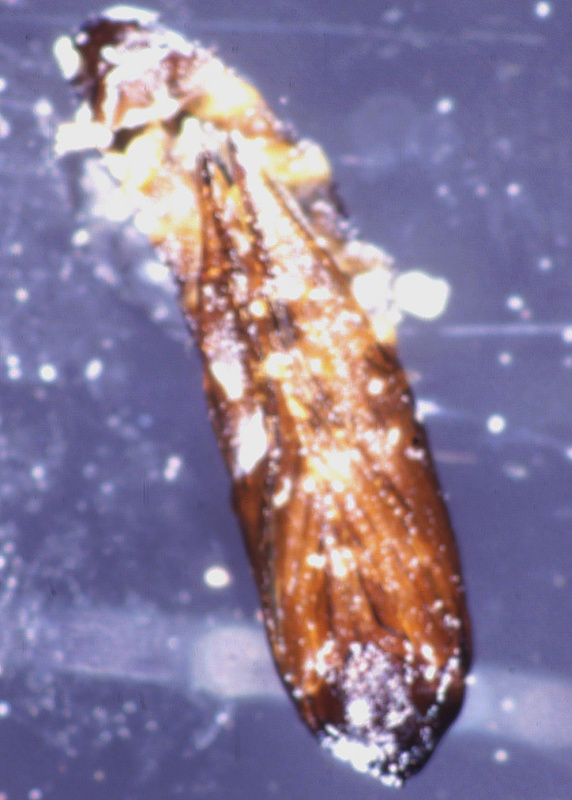 The larva then leaves the mine to create a molting cocoon. After molting in this cocoon, the larva feeds near the leaf edge. After about 4 days, a second molting cocoon is made. The last stage larva appears a couple of days later, and skeletonizes foliage for about a week. In mid-summer (early July in New York), a cocoon is formed in which to pupate. The pupal stage lasts 1-2 weeks. A second generation occurs in late summer and fall. Winter coccons are often heavily parasitized. Larvae are preyed upon by spiders. V. Injury: Young larvae create narrow winding mines. Larger larvae skeletonize foliage. The second generation can cause heavy injury in outbreak conditions. VI. Monitoring: White, ribbed cocoons may be conspicuous in the winter. Because of the sporadic nature of this pest, neither formal sampling procedures nor thresholds have been established.